Ayurveda, the traditional Indian medicine, means “the science of life”. This 5,000-year old healing system is a complete natural science and is the most well-documented ancient health care system. It has recently been made popular in the United States with help from it’s most famous doctor, Deepak Chopra and because of it’s alliance with Yoga, which is the physical piece of the Ayurvedic healing system of natural wellness. Ayurveda with an emphasis on prevention, targets the root causes of imbalance through holistic approach to maintain health in all facets of living- Mind, Body and Spirit. The uniqueness of Ayurveda is to identify your unique body constitution and customize an individual plan for diet, life-style, daily routines, incorporate Yoga, meditation, preventative self-care etc…… to maintain optimal health and longevity. The Ayurvedic system works off of the premise that everything in the universe – dead or alive – is connected. If your mind, body, and spirit are in harmony with the universe, you have good health. When something disrupts this balance, you get sick. Among the things that can upset this balance is the wrong diet, unhealthy life-style, age, injuries, climate and seasonal change, and your emotions. Ayurveda recommends PANCHAKARMA to go more deeper to cleanse and detox these toxins to get rid of these chronic ailments. All Ayurvedic therapies are traditional treatments and are designed especially for you. Ayurvedic practitioners are trained to design treatments and treatment plans that are specifically designed for you. He or she will take into account your unique physical and emotional makeup, your primary life force, and the balance between all three of these elements. Ayurvedic body treatments are the crème de la crème of the massage world. They’ve been tried and tested through the ages in India, not only for relaxation, but for health benefits such as improving circulation, toning the muscles, calming the nerves, lubricating the joints, and increasing mental alertness. They are also used for supreme detoxification, skin health, energy, stamina, and better sleep. There are several key things that make an Ayurvedic massage different from a regular massage. From the training of the practitioner to the long-lasting effects, here are some of the things that set Ayurvedic massages apart from the rest. Our Practitioner – Alka Mulakaluri. In addition to Alka’s Ayurvedic credentials she is also certified and trained in traditional massage therapies, such as Swedish massage. Intention – Depending on the treatment, an Ayurvedic therapist focuses on clearing the energy channels in the body, moving and dislodging toxins, and balancing the chakras (energy centers). A simple shift in intention from rubbing the muscles to clearing the physical and energetic pathways can be the difference between a relaxing massage and a life-changing event. Sensation. The strokes and movements in Ayurvedic massage are more connected and made with specific intention, yet never painful. This increases circulation and lymphatic drainage … and feels utterly blissful. Most recipients leave feeling energized and rejuvenated. Benefits. Primarily, these unique treatments are intended to make the energy flow properly in the body, clear all physiological and energetic pathways, and reduce stress. Turn your next massage into an Ayurvedic treatment! Before your first appointment you will be asked to fill out a health questionnaire that is specific to Ayurvedic. This information along with a brief intake will help your Ayurvedic practitioner determine what your dosha, or individual body type, is and what type of oils or herbs to use during your treatment. 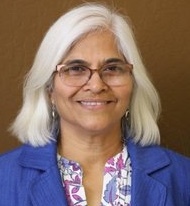 She graduated as a Wellness Practitioner from Kerala Ayurveda Academy, Fremont CA and has earned her diploma in Ayurvedic Sciences from AIA Foster city, CA . She is also a certified Panchakarma Technician and specializes in Panchakarma detoxification therapies and treatments and she is been trained in these Traditional healing techniques from well-known Ayurveda colleges in India.